← POWER UNPLUGGED . . . HOW ARE YOUR COMMITMENTS? THE BEST DEFENSE . . . IS A GODLY OFFENSE! You may have heard the old adage, “The best defense is a good offense” which simply implies the idea of being proactive rather than reactive. You hear this phrase used in a variety of fields. Sports teams that constantly press their opponent and score lots of points will usually win the game. Armies that don’t wait for the enemy to mount an attack but instead go on the offensive tend to gain the upper hand. This maxim proves especially true in the spiritual realm. On this side of eternity, we are surrounded by the powerful triple threat of the world, the flesh, and the devil. We face a constant battle on all three fronts, and at times the onslaught seems overwhelming. So how can possibly gain victory in this ongoing fight? For the Christian, the best offense is a godly, spiritual one: staying rooted in the Word of God. Instead of waiting for the attacks of temptation to test the outer edges of our faithfulness to Christ, we go on the offense by marinating in, meditating on, and memorizing the Scriptures—God’s living and active Word. You see, the more we are in the Word of God, the more the Word of God gets into us! In the apostle Paul’s famous “armor of the believer” passage in Ephesians 6:13-18, he exhorts us to take up “the sword of the Spirit, which is the word of God.” Bible scholars frequently point out that the Greek machaira, translated “sword” here, referred to the short sword that every Roman soldier carried on his belt for hand-to-hand combat. It was a powerful offensive weapon that the Roman legions had used to conquer the world. Our Savior’s encounter with the evil one underscores the fact that, as important as it is for us to marinate in and meditate on the Word of God, we must hide it in our hearts as well. 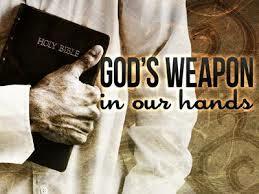 When we memorize the Word of God, it is readily available for us to decimate the wily serpent’s slings and arrows. Make no mistake, for every battle you face against the world, the flesh, and the devil, God has a Scripture to address that specific fight. Remember: to know what is written, we have to read what was written. So read your Bible regularly and develop your godly offense. I’ve written this on a number of occasions, but I want to remind you again that nothing—“neither death nor life, neither angels nor demons, neither the present nor the future, nor any powers, neither height nor depth, nor anything else in all creation, will be able to separate us from the love of God that is in Christ Jesus our Lord” (Romans 8:38-39). If you have placed your trust in Jesus Christ as your eternal Savior, there is nothing you can do, nor is there anything that the world, the flesh, or the devil can do to you, that will separate you from God’s amazing, gracious, eternal love.